The former supermodel raised eyebrows last night when she criticized Sports Illustrated for choosing the curvaceous Ashley Graham for one of the three covers of its 2016 Swimsuit Issue, claiming the magazine was showcasing a body type that isn't healthy. "Actually I don't like it that we're talking about full-figured women because it's glamorizing them and your waist should be smaller than 35 [inches]. That's what Dr. Oz said, and I'm sticking to it," Tiegs told E! 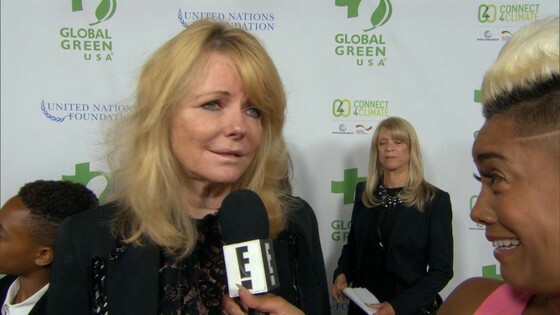 News at the 13th Annual Global Green USA Pre-Oscar Party when asked whether she was loving that we, as a society, are "stepping outside of our comfort zones of what we know as the [traditional] 'model figure.'" "No, I don't think it's healthy," Tiegs added. "Her face is beautiful. Beautiful. But I don't think it's healthy in the long run." Aside from the fact that that was a not-very-evolved or supportive thing to say—whether you're a woman, a man, a model, a former model, a random bystander, whoever—Tiegs ultimately just didn't know what she was talking about when it came to Graham's bod. One of the five "lifesaving numbers that you need to know," according to Dr. Oz, is your waist size—and the physician and talk show host indeed states that women with a waist size larger than 35 inches are at a greater risk of certain chronic diseases, like diabetes. Fair enough. But Tiegs jumped the gun by even invoking that number, because Ashley Graham's waist measures in at 30 inches, per the stats listed on her official IMG Models page. The 5-foot-9 brunette made her Swimsuit Issue debut in a print ad in 2015, and this year she landed one of three covers, sharing the illustrious honor with Ronda Rousey and Hailey Clauson. But now we apparently know what Tiegs, a three-time SI Swimsuit Issue cover girl in the 1970s and '80s, really thinks about the most useful beauty trend in recent years—the growing presence of women of all shapes and sizes in the modeling world. "I had agents tell me, 'You'll never get on the cover of magazines. You'll never be an editorial model,'" Graham told E! News at the SI cover debut party this month. "I had agents wave money in my face and say, 'If you drop some pounds, you can have a lot more of this!' And not even THAT was something that encouraged me to lose weight!" The model, who also has her own lingerie line, continued, "The moment I realized I had to be healthy and happy in who I was, that's when my career took off." Neither Graham nor Sports Illustrated has commented on the opinion Tiegs shared. Tiegs, who is active in environmental and health-related causes, did take to Twitter this evening, meanwhile, to explain herself. "To clarify re bodyweight. Being anorexic/bulimic/overweight all connected to health problems. I want all to be as healthy as they can," she wrote. But there's no need to lecture Ashley Graham about taking care of herself. "I believe you can be healthy at every size, and if you take care of yourself, it doesn't matter how big you are, from a 2 to 22, you can be active and love the skin you're in," Graham, who also has her own Curvy Fit Club workout videos on YouTube, told Vogue after her first SI appearance in 2015. "I'm trying to get the message out there, not just younger girls but older women who have become bigger from age, just to love every inch of themselves." And some women would do well to show each other a little more love while they're at it.